It was just this past February that acclaimed Christian filmmaker Rolf Forsberg passed away at the age of 92, a man far from a household name yet a man who could easily lay claim to being one of the most iconic figures in the early faith-based cinema scene that began for Forsberg in the early 1960's when he was commissioned to write and direct a motion picture for the Protestant and Orthodox Pavilion of the 1964 New York World's Fair. Forsberg's result was Parable, an allegory that imagined the world as a circus redeemed by a Christ-like figure portrayed as a clown. Officials of the fair tried vigorously to ban the film from being shown, but Parable was shown again and again during 1964 and 1965 to appreciative audiences and substantial critical acclaim including a Gold Lion from the Venice International Film Festival, a Hugo from the Chicago International Film Festival, and a citation from Cannes. In 2012, Parable was added to the National Film Registry, which annually honors "Distinguished achievements in filmmaking considered of enduring importance to American culture." Yet, be honest. You haven't heard of Parable, have you? There's a pretty good chance that you haven't heard of the other three films included in this collection including The Antkeeper, Ark, and One Friday. That's a pity. Really. 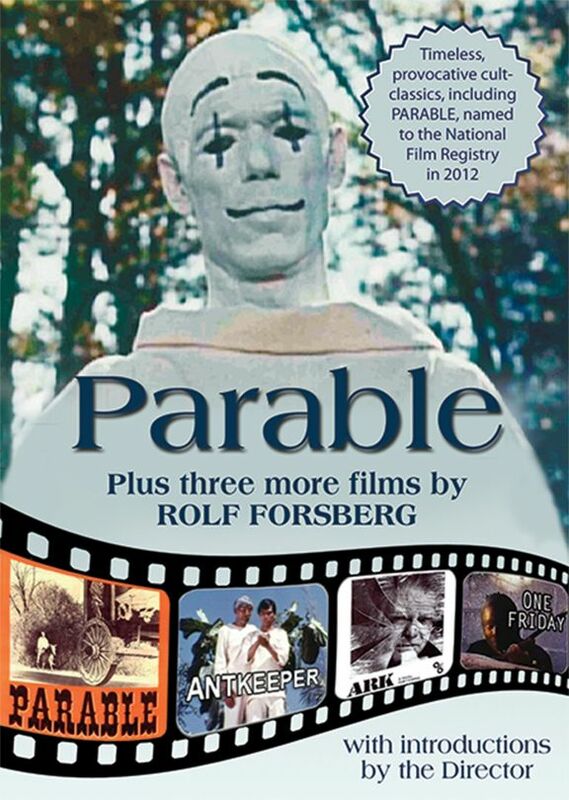 While the four Forsberg films included in Parable: Four Films by Rolf Forsberg may not hold up to today's technological advances, they are groundbreaking examples of faith-based cinema long before faith-based cinema was really considered a thing and even before those days when just the phrase "faith-based cinema" made you cringe because you knew that meant badly acted, preachy films with no cross-over potential and no true critical value. These films? Believe it or not, they're different as evidenced by the massive critical praise that met and continues to meet Parable, the iconic short film that started it all for Forsberg. In 2014, the Gospel Films Archive was established in an effort to uncover thousands of faith-based 20th century shorts, features and TV shows languishing away in undigitized 16mm format existing in private film archives like Regent University, Wheaton College and Notre Dame. These inspired films were created by pioneer Christian filmmakers like James K. Friedrich, Sam Hersh and Ken Anderson. Working with little funding and with an unknown market potential, the Gospel Films Archive began three years ago to create this film with Forsberg's full cooperation as evidenced by his video intros for each of the four short films included in the collection. As I was exploring the credits around Parable, it was a telling revelation that the film had zero critic reviews and two user reviews - of the two user reviews, one was for the max score of a "10" and the other for the lowest score of "1." Indeed, that may very well tell you everything you need to know about the artsy, creatively inspired short film that may qualify as one of the earliest examples of an arthouse faith-based film. Throughout his career, Forsberg remained a visionary filmmaker whose films tackled bold subject matter in complex, entertaining and decidedly non-preachy ways. 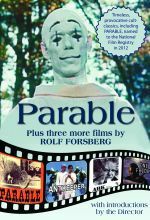 While there's little doubt that Parable is his best known film, and certainly the best known of the four films in this collection, Forsberg made many other shorts throughout his career and attracted involvement from a wide array of folks. Forsberg's films entered the scene during a time when churches were just starting to deal with the impact of mass media on worship and Forsberg, most likely more than a good majority of faith-based and inspired filmmakers, embraced the challenge with a boldness that is still seldom seen. The Antkeeper features narration by Fred Gwynne (The Munsters), a sure sign that Rolf's acclaim as a filmmaker had attracted a wider base of support. The film also features lensing by renowned Disney's True Life Adventures cinematographer Robert Crandall and explores in a Felliniesque manner the story of mankind as represented by a gardener, his son, the "wicked one" and a world populated by ants. Filmed on a $175,000 budget and released a couple of years after Parable, The Antkeeper is a more socially aware film that, for me, resonated most deeply of the four films in this collection. Of course, that may very well have a lot to do with my own passion for Fellini films. Ark is essentially a climate change film before climate change was even in the conversation. A deeply moving film, Ark is Forsberg's prophetic vision of environmental and spiritual degradation via one man's desperate attempt to protect a sealed ecosystem from hostile intruders. The film is stark, even jarring, and at times almost feels like it belongs alongside a Mad Max type of film. There's a pervasive bleakness in the film, though to explain it much more would be to ruin the film's impact. Suffice it to say that Ark is a leering, intrusive film that stays with you long after its closing credits. One Friday, an early 70's faith-based short that tackled civil rights and race riots and actually starred Forsberg's own young son as the toddler in the film. Grounded within 1 Corinthians, and all of Forsberg's films are grounded within Scripture, One Friday is noteworthy for its electrifying ending and for a boldness that even now is rare in faith-based cinema yet still manages to avoid preachiness. Available on DVD and via digital download, the Parable collection is a must own for fans of Christian cinema and for those who embrace the history of said cinema. One simply must admire the work of the Gospel Films Archive in preserving these films and in their next effort to preserve the entire collection of the Cathedral Films Library. Parable is a short holy fool story about a mysterious clown who’s redeeming some of the people in a circus. It is a very artistic movie that was featured at the 1964 World’s Fair in New York. Many of the director’s movies, such as The Antkeeper, are direct allegories of the story of Jesus. Parable has some loose ends. The movie opens with circus wagons passing along a country road. In one of the wagons stopped by the side of the road, a man wakes up to start putting on his makeup. Walking behind the wagons is a clown in white makeup and clothes. When one of the men gathering water for the elephants collapses from exhaustion, the clown picks up his buckets to carry his burdens to the elephants, and so the circus worker follows him. When one of the attractions features a man in a coat and tie throwing baseballs at a target to dunk an African-American man in a chair over a small pool, the clown takes the place of the African-American man and gets dunked. The African-American man follows him, but the man throwing the balls collects some balls and chases after the clown. In the sideshow, the clown takes the place of the woman in the box being stabbed with swords. She too follows him, but the magician with the swords and the carnival sideshow barker furiously go after the clown. In the circus, a puppet master has a real-life Punch and Judy show suspended from trapeze wires with an executioner suspended next to them on the same wires. The puppet frames are clearly three crosses. The clown comes into the circus and starts cleaning and polishing the shoes of the children in the audience, ruining the puppet master’s show. Chaos ensues and when Punch and Judy and the executioner fall to the ground, the clown is hoisted up onto the cross-like trapeze rigging. The disgruntled baseball thrower, ticket seller, magician, and puppet master all attack the clown as he rises into the air. Parable is shot mostly with music and no dialogue, except during the crucifixion allegory. There is a hint that Jesus Christ is resurrected in the hearts and actions of those he saved. This would conform to the German school of higher criticism. There’s no way of telling whether this was the filmmaker’s intention, but from the rest of his movies, he seems to be very orthodox in his faith. Parable became a very popular, artistic teaching tool for the church and has just been re-released by Vision Video. It is a wonderful movie sure to inspire many discussions about Jesus. This quartet compilation of short works by maverick, unpredictable, now-93-year-old writer-director Rolf Forsberg strongly hints at the array of idiosyncratic styles that he cooked up over four decades. Best known for co-directing the 1979 biblical doomsday documentary The Late, Great Planet Earth (narrated by Orson Wells), Forsberg's greatest honors came for the strange 1964 short "Parable." A tale about Jesus Christ told as an allegory set in a circus, "Parable" was entered into the Library of Congress's National Film Registry in 2012 and received accolades at major film festivals upon its release. "Parable" presents Jesus as a donkey-riding clown who wanders into a circus and draws the instant loyalty of some and wrath of others, culminating in a unique variation on the Crucifixion and Resurrection. Relatively crude in technique, the film's real draw is such dreamlike touches as human marionettes, and a circus audience of hoodied children. The second short, 1966's "The Antkeeper," tells another surreal tale about Christ, in which an old man turns his son into an ant. Narrated by Fred Gwynne, "The Antkeeper" is somewhat reminiscent of "bad trip" scenes from the era's B-movies. Forsberg turns his attention to the environment in the 1970 shoestring-budgeted "Ark," a dystopian and effective fable about a survivor of ecological devastation who tries to save a pond by bringing some of its critters and plants inside an old greenhouse. Finally, 1973's "One Friday" is a weird little peacenik movie about the end of innocence, in which a toddler walks past the corpses of his parents only to find many more bodies strewn around in a civil war that is about to claim him as well. Viewers have the option of watching all of the selections with brief, often illuminating introductions featuring Forsberg himself. A solid collection of classic religious shorts, this is recommended. This file includes four films by Rolf Forsberg: Parable, The Antkeeper, Ark, and One Friday.